At 326 pixels per inch, the new iPad mini with retina display features the sharpest tablet screen we’ve seen from Apple(s aapl) yet. And it’s evenly matched against the larger iPad Air in every other regard, which made me declare it the new Apple tablet most people should buy. But according to a review by Anandtech, the new iPad mini falls short against the iPad Air when it comes to color accuracy. According to the review, Apple has chosen to use the same color gamut for the tablet as it did for the original iPad mini. This is significantly narrower than the sRGB coverage used by the iPad Air, as well as other tablets such as Amazon’s(s amzn) Kindle Fire HDX 8.9 and the Nexus 7. This means that the iPad mini has a smaller subset of colors it can use to reproduce an image. Anandtech quantified the results using Delta-E, which measures the difference between a requested color and the actual color shown. 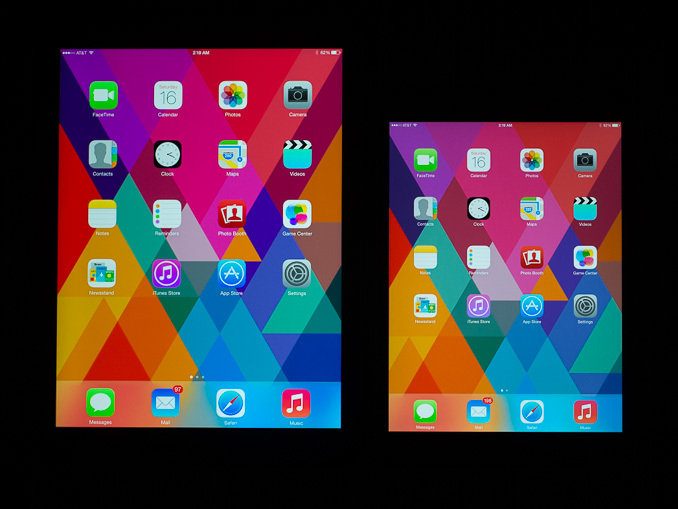 The previous generation iPad 4 and the current iPad Air came out on top, with scores of 2.41 and 2.42 respectively. With scores like these, the difference between the color requested and the color shown should be nearly imperceptible. The iPad mini with retina display, on the other hand, scored 6.52, which means you can definitely see a difference, like the in the image below. As you can see, in real world use this isn’t a major issue. It definitely shouldn’t keep you from buying the iPad mini if it’s your tablet of choice. But it’s worth keeping in mind if you were expecting to get the exact same experience from the iPad mini as its larger sibling. If the Air has better color accuracy, then why are its web links often purple rather than blue?! The Mini’s (1st and 2nd gen) are proper blue! Thank you, glad to see the iPad Air bests the Mini in some way. Tired of hearing people say why bother with the air but I love the larger screen. Why does this even matter to you? You already know it “bests” it in terms of screen real estate and processor benchmarks. This could only be an issue if you have buyer’s remorse or, for some reason, can’t stand people opting and praising something you don’t like. I find it a tad baffling, like someone raging over a person finding their Ferrari is better than a Ford F-150 when they’re not remotely analogous. Thank you, so glad to hear something the iPad air bests the mini at. Everyone says the iPad mini is such a better deal but I perfer a larger screen. everything else is just people wanting to write/talk just for the sake of it.. Agreed. They all seemed to follow. We need more innovation in technology not all these little tiny improvements. If you’ve read any of the iPad mini reviews, you’d see that term Retina is still a very big deal to everyone. You do know that Apple didn’t invent the Retina display. Right? Apple doesn’t actually make any of their own displays. They get them from Samsung and others. Everything in the iPhone is sourced by other companies. Apple only assembles the pieces. Even the processor is licensed from ARM and made by Samsung. Correction: Apple switched screen suppliers for the iPhone 5/5s. They now get iPhone screens from JDI, LG and Sharp.